Captain Janeway of Star Trek Voyager was my childhood hero- I loved watching her conquer the Borg, face down Species 8472, and flirt with (but never consummate) romance with Chakotay. What? You don’t have the slightest clue what I’m talking about? Then clearly, you’re not a Trekkie. It’s OK- I still love you for reading my blog, but you might want to just check out the pics and skip my commentary here. Still reading? Good. Let’s talk Trek. I watched all the Star Treks growing up, and though voyager was my favorite, I loved them all. 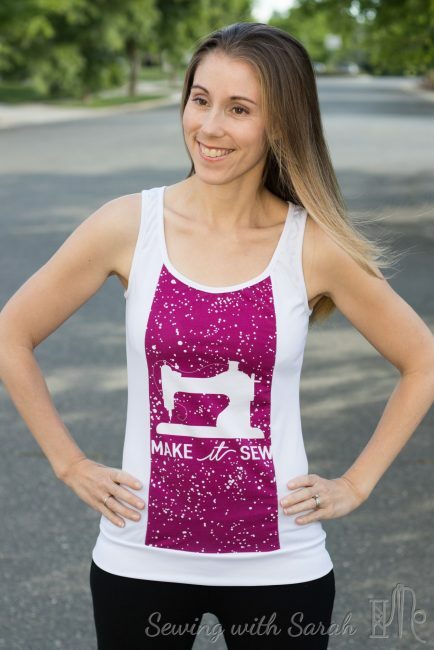 So when I was chosen to sew strike offs for the Space Round at Star Dust and Moon Beam and they sent me the “Make it Sew” panel and starships coordinate in Bamboo, I was in geeky bliss. I used the Hallå Stardust Tank to make the best use of the panel, and white mesh from Joanns fabrics for the side sections and bands. Bamboo! If you haven’t sewn with this bamboo, you NEED to. It’s a similar weight to Cottom Lycra, and just as easy to work with, but it’s cooler and has a beautiful drape. I’m craving more the way Janeway craved coffee after 7 years in the delta quadrant. The fit of this tank is perfection, and I used a binding on the neck and armholes to keep it neat and tidy. I can even nurse in it! Seriously, I love this tank and can’t wait to get questions on it- that I’ll answer with tons of geeky Star Trek trivia. And someday, I’ll go to a convention and wear this tank the whole time! Ok, maybe that’s a bad idea- better order more from this round. So glad you found me- we trekkies gotta stick together! I still love watching old episodes!